Why is flossing so important? We don’t just preach it because it makes our job cleaning your teeth easier when you come on for your regular cleaning at our office, we genuinely want our patients to enjoy the benefits of having healthy gums and great smiles! Regular flossing of your teeth removes the food particles and plaque buildup that are impossible for your toothbrush to reach. There are places under the gumline and between your teeth where plaque can build up – this leads to gum disease. Using dental floss to get in between the teeth and clean breaks the cycle of bacterial plaque buildup – called biofilm – on your teeth. Biofilm left on your teeth will allow for bacteria to colonize and survive, changing the chemistry of your mouth and putting you at a higher risk for gum infection (called ‘gingivitis’) and gum disease (periodontis). Eventually these conditions can threaten your teeth. Oh No! What are the signs of gum disease? The scary thing about not flossing regularly is, if you are not doing it, you might not see the immediate problems your gums are suffering from leaving out this important step of dental hygiene. You won’t notice visual signs of gum disease or feel any pain. When you visit our office, we will be able to notice the subtle signs, and warn you. Don’t stress, this is not uncommon… we issue gentle warnings to patients every day. Have you slacked off on your flossing routine? If so, you may notice your gums are a bit tender, red and they may bleed when you brush or eventually floss your teeth. Sadly, some people consider this to be normal. But healthy gums aren’t supposed to bleed! Bleeding and/or painful gums are a sign that lack of flossing is causing a problem… yet these symptoms are no excuse to avoid flossing. Keep flossing because after about two weeks the symptoms should subside. Make sure you talk to Dr. Wolfe if you are experiencing pain or bleeding when you floss. Typically, getting back into a good habit of flossing and using mouthwash will improve and maintain the health of your gums. For advanced gum disease, you might need extra help from us to get your gums healed and your and teeth restored. We’ll discuss the options if gum disease reaches this stage. Symptoms of advanced gum disease include painful, loose teeth. It is never too late to restore a beautiful smile. 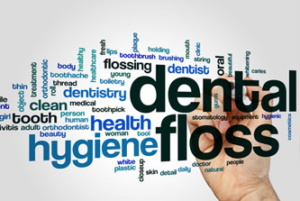 The good news is that a habit as simple as flossing regularly makes sure gum disease doesn’t have a fighting chance! Is there a right and wrong way to floss your teeth? 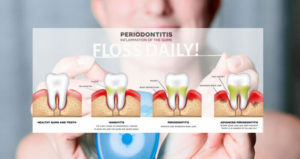 Handy small brush and pic tools are nice to have in your pocket or purse, to discreetly clean your teeth after a meal, but there’s no substitute for regular flossing as part of your morning or evening brushing routine. There is really no ‘wrong’ way to floss your teeth. We encourage patients to wiggle and jiggle the floss thoroughly between each tooth. Of course you would not want to injure your gum but it is okay to firmly move the floss along your gumline without harshly forcing it against the delicate tissue. We hope that by reading this, you’ll understand the importance of flossing. You may have read different views, opinions or advice on this topic from various internet sources. At New Town Dentistry, we see the effects of great dental hygiene habits every day, and we are here to assist people who have not practiced the best care by repairing and restoring teeth and gums with custom tailored treatment plans. In addition to flossing, we recommend using an electric brush (Oral B and Sonicare are popular), as well as a rinse (Listerine) to complete your night time routine. We want everyone to enjoy having a GREAT smile!